If you have been wanting to try your hand at a four-string, these videos are for you! 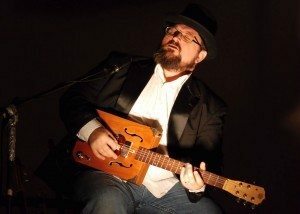 These two lessons from Shane Speal walk you through getting started playing sweet, sweet music on a 4-string cigar box guitar tuned G D G B (open G). Click here or on the image to the left to see the full post on CigarBoxNation.com! 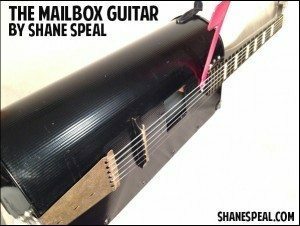 Shane Speal may be King of the Cigar Box Guitar, but he doesn’t just stop there – he has built and collected an amazing variety of crazy homemade instruments. 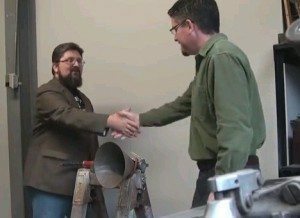 In the article linked below, he walks you through how he built a dobro (resonator guitar) using a cheap metal mailbox. I’ve seen him play this monster on stage and it really has a great sound, so if you have been looking for something cool and different to build, click the image below and check it out! Shane Speal, the man who started the modern Cigar Box Guitar movement, talks about how he rediscovered the cigar box guitar, and why he continues to play them 22 years later. Have you heard of CigarBoxNation.com? “King of the Cigar Box Guitar” Shane Speal founded it back in 2008 to be the home of the Cigar Box Guitar revolution, and since then it has grown to over 13,000 members worldwide, with tens of thousands of photos, videos, dozens of topical groups and hundreds of thousands of forum and blog posts. It is a great place to get to know other builders, share photos and videos of your creations, ask questions and learn about this wonderful, crazy hobby. Stuff posted on Cigar Box Nation is a lot more “permanent” and easy-to-find than posting things on Facebook groups, too – your stuff can always be easily found on your profile page. So if you are just getting into cigar box guitars, or are a long-time enthusiast, you should discover (or re-discover) Cigar Box Nation! 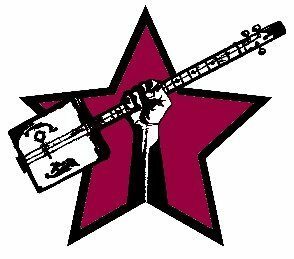 Long live the Cigar Box Guitar revolution! In this documentary, which is currently running on the local TV station in York, PA, Shane Speal and Ben “C. B. Gitty” Baker explore the secrets of the York Steam Whistle Christmas Concert – the last of its kind in the world. This steam whistle concert has been going on since the early days of the 1900’s, and the current whistlemaster has been at his post performing the concert every Christmas Eve for the past 60 years. While Shane explores the story of the steam whsitle concert, Gitty builds a 116db pneumatic slide whistle from and old bicycle pump which Shane later plays onstage at a live concert. Along the way, Shane and Gitty discover and play an amazing forgotten instrument known as a “horse fiddle”, and they manage to get all giddy schoolboy-excited over crazy homemade instruments. Shane even performs an original song “Chasing Steam” on his cigar box guitar. The Chasing Steam documentary starts around the 14 minute mark; the portion of the show before that features a poetry reading of a forgotten female poet from York, PA, with Shane playing in the background. Have you seen this? 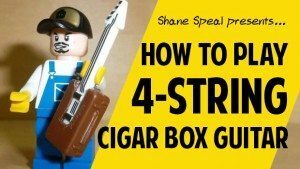 It’s a video lesson where the King himself, Mr. Shane Speal, walks you through how to tune your cigar box guitars and play them like Seasick Steve! Back in the mid 1990’s, Shane Speal played a primary role in the rediscovery of the cigar box guitar. Drawn to their primitive, raw sound and power, and how far removed they were from the main-stream musical establishment scene, he declared the start of the Cigar Box Guitar Revolution. These days, 20 or so years into the modern CBG revival, people sometimes roll their eyes or scoff a bit when we still refer to this movement as a revolution. I am here to tell you it still is, and I just a reminder of why this morning. A couple of days ago, I posted a knowledgebase article on Zero Frets, with the goal of introducing cigar box guitar builders to this often overlooked or misunderstood topic. This morning I found in my inbox a comment from a man who is a luthier, and runs a website dedicated to luthiery. I will not name him or his site, that is not the point of this blog post. Suffice to say, it is the sort of site where the subcellular structures of certain strains of Sitka spruce grown in certain soils, and the effects of all of that on tonal quality, are discussed.